December | 2010 | Go Chapel Hill! Chapel Hill Transit (CHT) will implement detours due to street closures during the Chapel Hill-Carrboro Holiday parade Saturday, Dec. 11. The parade will begin on East Franklin Street at the Morehead Planetarium, travel west on Franklin Street, and end at Carrboro Town Hall on Main Street. CW – 9:45 a.m. – 11:45 a.m.
FG route – 8:30 a.m. – 11:10 a.m.
DM route – 8:30 a.m. – 11:30 a.m.
JN route -100 a.m. – 11:30 a.m.
T route – 8:15 a.m. – 11:45 a.m. The Saturday CM and NU routes will operate on regular schedules. For specific information on the detours, please visit chtransit.org or contact a CHT customer service representative at 919-969-4900. 2010 Annual Go Chapel Hill Transportation Conference Well Attended! On November 19, Transportation Management Coordinators gathered for the annual transportation management meeting to discuss and receive the newest information regarding alternative transportation in the Chapel Hill/Triangle area. Long Range & Transportation Manager reported that according the annual survey data, that over 80% of those working in Chapel Hill live outside the Town Limits and while there is an increase in the use of alternative transportation, there is much work to be done yet to grow the number of employees carpooling, bicycling, walking or using transit to get to and from work. As part of the event each year businesses receive recognition for outstanding participation, alternative growth & amenities program. J.B. Culpepper, the Town’s Planning Department Director, presented the awards. 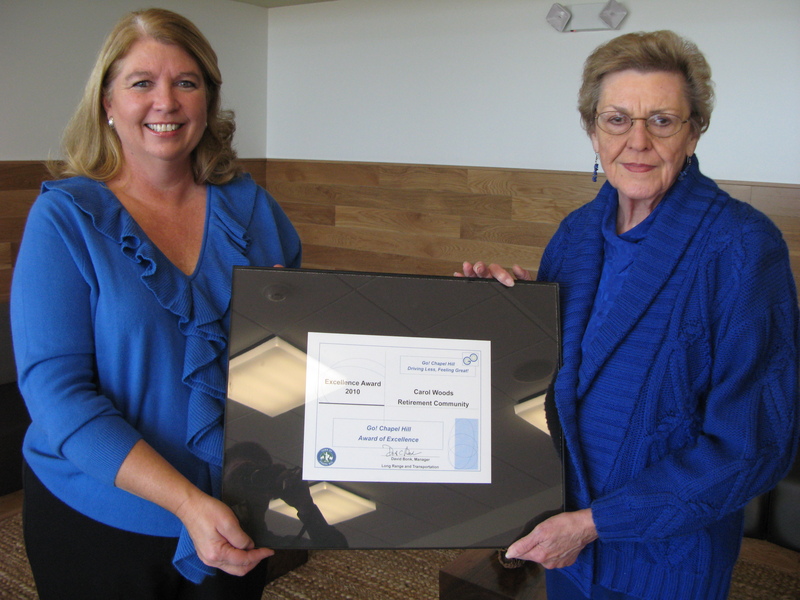 Carol Woods received the local 2010 Go Chapel Hill Award of Excellence, while Silverback Asset Management received the 2010 Golden Ticket regional award. 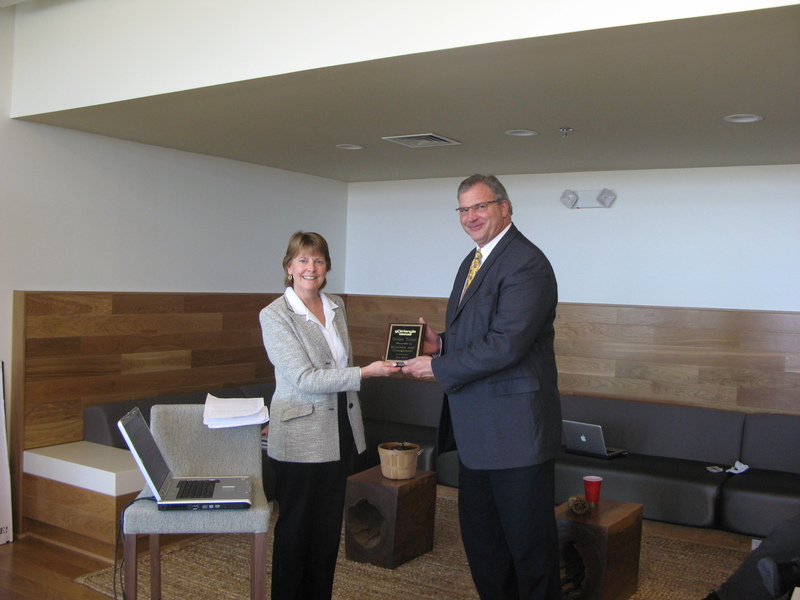 Transportation Demand Management Coordinator Len Cone presenting award to Carol Woods. Chapel Hill Transit (CHT) will operate on a winter break service schedule from Saturday, Dec. 18, to Saturday, Jan. 8, 2011. The weekday CM, CW, D, J, NU and V routes will end earlier. Safe Rides and Saturday/Sunday U & NU routes will not operate. EZ Rider services will end at 10:35 p.m. Monday through Friday. The last scheduled pick-up window will be 10:25 – 10:45 p.m. Regular service will resume on Monday, Jan. 10. For specific schedule information, please visit www.chtransit.org or call a customer service representative at 919-969-4900. Friday, Dec. 24 – Saturday Service (No U or NU routes). The Hillsborough Express 420 route will operate. Monday, Dec. 27 – Saturday Schedule (No U or NU routes). Friday, Dec. 31 – Saturday Schedule (No U or NU routes). CHT administrative offices will be closed from Friday, Dec. 24, to Monday, Dec. 27 and will reopen at 8:30 a.m.